Munster full-back Felix Jones discovered on Sunday that the ankle injury he sustained against France will keep him out of the World Cup. IRELAND FULL-BACK FELIX Jones has been ruled out of the World Cup in New Zealand, after it was discovered that he had damaged ligaments in his foot against France on Saturday. The Munster star underwent an MRI scan on Sunday that confirmed the bad news. Jones’ injury will be monitored by a specialist, who may or may not rule out surgery, but at the very least the 24-year-old will need to undergo a six-week period of immobilisation. The Ireland squad will be announced on Monday at 1pm. “He had certainly put himself into contention over pre-season and the games in the last three weeks,” McNaughton added. Email “Ireland’s Felix Jones ruled out of the World Cup with foot injury”. 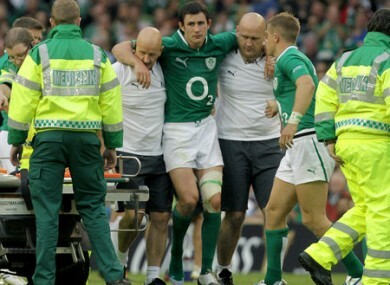 Feedback on “Ireland’s Felix Jones ruled out of the World Cup with foot injury”.